Successfully Added Emergency Traffic Cone with Flashing Light to your Shopping Cart. 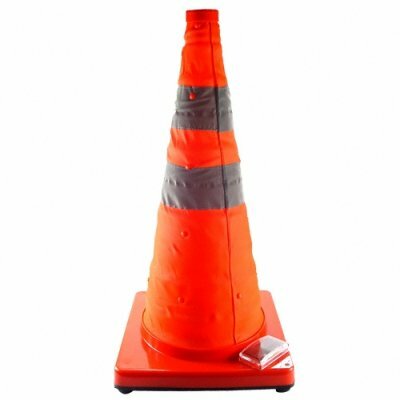 The Emergency Traffic Cone is colored in highway safety orange, has a very convenient collapsible design, and is made of waterproof thick vinyl cloth type material. How does it work? The traffic cone stores in your vehicle as a compact 70mm's tall and then when placed on the roadway you pull up on the inner ring and the cone expands to its full height of 565mm's. The cone has and expandable inner skeleton made of durable ABS plastic, so it can easily withstand all the usual disturbances of high speed cars and trucks, wind and rain, and other outdoor elements with ease. The cone has a heavy gauge two piece molded base and four rubber feet so it keeps its same place on the road all day. This model traffic cone is even more effective than the standard cone. Why? Because not only is it made of highway safety orange color vinyl cloth, but it has two high reflectance strips and best yet - it lights up! Yes, it has three internal red colored LED's that constantly flash when turned on, so it is visible during the day or night. And if you are worried about where to store it, we have you covered. The emergency traffic cone retracts so as to be compact enough to fit in as small of a space as the underside of your car seat. There is no reason why you couldn't buy two or four of these to keep in your car for peace of mind and safety while on the road. Help your customers protect themselves and their loved ones with this 21st century safety traffic cone. Makes a great product for the re-sale and car accessories market. Brought to you by the original direct from China wholesale electronics source, Chinavasion. Emergency Traffic Cone for roadway safety or crowd management. Portable design. Retractable to compact size for easy storage in car and then expand to true size as needed. Traffic cone has internal flashing LED light source with ON/OFF switch. Other functions: Parking lot control, blocking off driveways, traffic control, building maintenance safety, etc. on 2009-10-31 20:30:40 looks like a real product for safety especially in the deloping country.